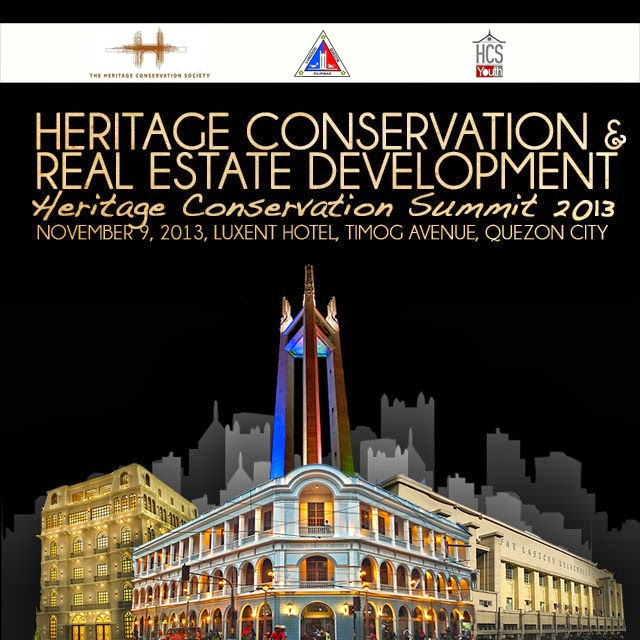 The Heritage Conservation Society and the City Government of Quezon City will organize the Heritage Conservation Summit 2013, on 9 November 2013 at Luxent Hotel, Timog Avenue, Quezon City. The Summit, which is being organized for the second time, has adopted the theme: Heritage and Real Estate Development. It is aimed at bringing together a wide spectrum of participants representing national government, local government units, local historical and heritage societies, academe, heritage conservation practitioners and allied professionals, architects, planners and real estate developers, the tourism industry, and the media. Its primary objective is to discuss and exchange knowledge on the current state of heritage conservation and best practices of adaptive reuse in the Philippines and Asia, its recent developments and the challenges and opportunities faced in the conservation of heritage. The presentations will include successful experiences of real estate developers, local government units and community conservation groups. We have 200 available slots for the Summit. It will be a one-day affair, with the second day allocated for an optional tour of heritage buildings and sites in Quezon City for interested participants on a first come first served basis. We invite you and your company, organization, agency or school to participate in the summit and learn more about the importance of heritage to real estate development. On-site registration is Php1,500 inclusive of conference kits and meals. Pre-register by Wednesday, November 6, 2013, to avail of discounted rates. If pre-registered, participation fees are Php1,000 for professionals, Php800 for HCS members in good standing or masteral students with ID, and Php300 for undergraduate students with ID. Please issue check payments to HERITAGE CONSERVATION SOCIETY. Cash or check payments could be deposited to BPI C/A No. 8105-8153-61, BPI MH del Pilar Branch. Remember to e-mail your deposit slip to info@heritage.org.ph together with this form and keep the original deposit slip which you have to submit on the day of the summit. 15:30 - Establishing a Heritage Trust in the Philippines – Atty. Mark Evidente, President, TwoEco, Inc. 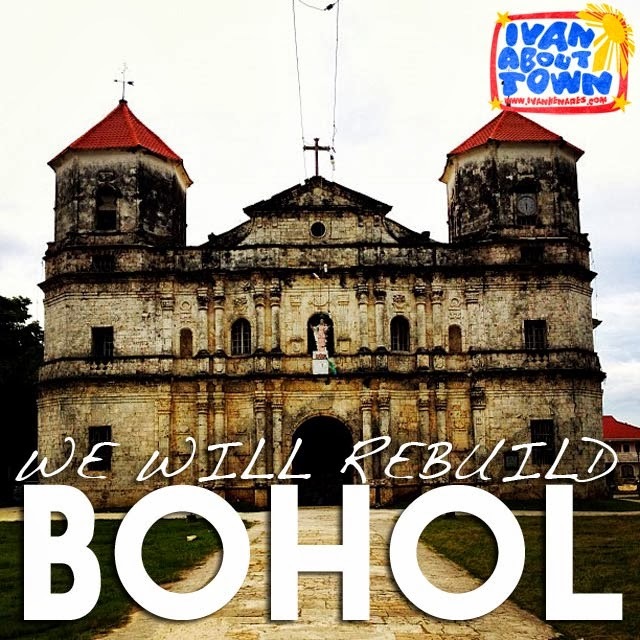 The Diocese of Tagbilaran has always been exemplary when it comes to heritage conservation. In fact, they are the only diocese in the country actively getting their churches declared, thanks to the efforts of Fr. Ted Torralba. Which explains why they have more than ten properties declared as National Cultural Treasures or National Historical Landmarks within their diocese alone. Being declared properties, the NCCA and its attached agencies will have a lot to do with the restoration of many of the churches damaged by the October 15, 2013 earthquake in Central Visayas. But the effort will mainly be an undertaking of the Diocese of Tagbilaran which covers the southern half of Bohol Province. To get a receipt for your donation, e-mail your deposit slip to the Diocese of Tagbilaran thru j_asion@yahoo.com or fax to (038) 4115653. List of donors will be published. When the plan developed by the Heritage Task Force is in place and implemented, expenses will also be published. 1. How the restoration will be undertaken and who will be on board? The Diocese of Tagbilaran has a long-standing commitment with the NCCA, NHCP, and the NM to abide by accepted national and international standards of heritage conservation. It has a functioning Diocesan Commission for the Cultural Heritage of the Church established in July 1995, predecessor to an earlier diocesan committee for church restoration created in 1993, to monitor intervention on heritage churches, implement the cultural heritage law of the Church and of the Government, and recommend approval of any heritage intervention, subject to the authority of the Bishop of Tagbilaran who has the final decision on the pastoral care of heritage resources. Its activities in the area of the pastoral care of the cultural heritage resources of the Church prompt the creation of the CBCP Permanent Committee of the Cultural Heritage of the Church and advanced the preparation of the Holy See - Philippines international agreement on the cultural heritage of the Catholic Church in the Philippines. In the present circumstances, it awaits the results of the rapid assessment of the NCCA Heritage Task Force (coordinated by the undersigned) which is expected to be released this coming Monday, 21 October. The Diocese will abide by the restoration and/or reconstruction plan developed by the said Task Force. It awaits the rapid creation of the Task Force's field office headquartered at the NM's branch in Tagbilaran opposite the Tagbilaran Cathedral. Aside from technical experts from the National Government cultural agencies, the Diocese fields its Sacred Architecture Committee members as collaborators with the Task Force's field office. This said committee is one of five under the Diocese's Commission for the Cultural Heritage of the Church. It is constituted of four architects trained in heritage conservation and two structural engineers. 2. What form of cooperative engagement will we have here? MOAs will be signed on Thursday between the NM (which has jurisdiction over all the declared churches in the Diocese), the Provincial Government of Bohol, and the Diocese of Tagbilaran. The MOAs come under the umbrella of R.A. 10066 and the above-referenced Holy See - Philippines international agreement. Bilateral or multilateral agreements will subsequently be entered into with other National Government cultural agencies as the needs arise. 3. How will the donations be managed and reported? On the matter of donations to the Diocese of Tagbilaran for restoration and reconstruction, all will be receipted and accounted for. List of donors will be published from time to time as well as expenses incurred during the restoration process. The Diocese has the time-honored custom of printing in the weekly news bulletins of its parishes all the donations, tithes, offerings given and the expenditures incurred. It will do the same for this massive project. This is a list of built heritage damaged during the October 15, 2013 earthquake that hit Central Visayas. This list is not limited to religious structures. Please update this list by commenting below. Here are some tips for applying for an Indian visa in the Philippines. Although Tourist Visa on Arrival is available for Philippine tourists (details below), it's best to get a visa here in the Philippines. The application process is very straightforward as long as you are able to submit all of the requirements. If there are missing requirements, that will create problems. It takes 4 to 5 working days for the issue of a tourist visa. The application form is completed online and once accomplished, is printed out for submission to the application center in Makati. Here is the website for the online application. 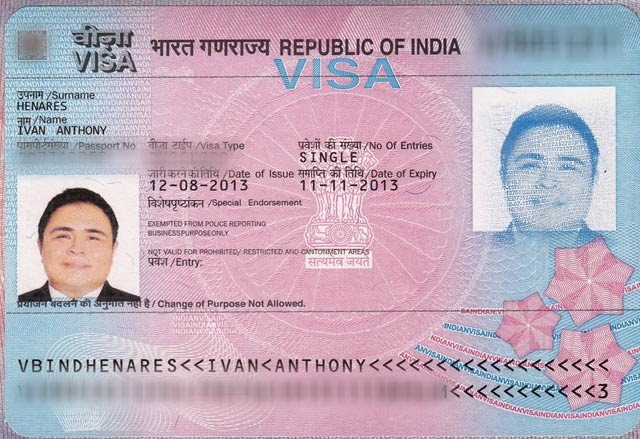 BLS India Visa Application Center is located at 902, One Corporate Plaza, Arnaiz Avenue, Makati City. Here is a location map of the application center. 7. Visa fee of Php2,210; Php148 BLS service charge; and mandatory passport delivery fee of Php190 (whether you prefer to pick it up or have it delivered, this is not refundable) for total of Php2,548. 8. 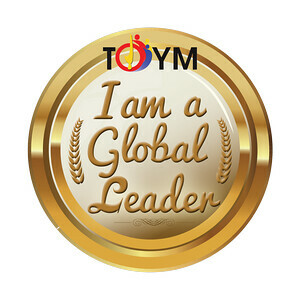 Invitation letter from family, friend or sponsor in India (if applicable). You may also be asked to produce a certificate of employment and other documents. Applications are accepted from 9:00 a.m. to 12:00 p.m. and are released between 4:30 to 5:30 p.m. unless you select the courier service which can be delivered anytime within the day. For inquiries, you may contact BLS at (02) 5555060 or 4789152 / Fax No. (02) 4789152 or via e-mail at info@blsindiavisa-ph.com. It's best to apply at least 2 weeks before your flight to India. The average waiting time to get a TVOA at the airport is between 3 to 4 hours because of the long lines. So if you're in a tour group or need to get out of the airport quick, you have to get your visa in the Philippines. The TVOA valid for 30 days is available to Philippine passport holders entering India through the airports of Delhi, Mumbai, Chennai and Kolkata, whose sole objective for visiting India is tourism, casual visits or short duration medical treatment. You should present your passport with at least six months validity and your return ticket, and prove availability of sufficient funds for your stay. Visa fee is US$60 payable in its equivalent in Indian rupees. Fill out the application form when you arrive at the airport and attach one passport size photograph. Here are the complete details of the TVOA.